Hello ! My name is Anh. My major is not music but the piano has come along with my life since I was six years old. My passion for music helped me keep playing during the busiest times. I have been collecting classical CDs for many years, including both piano and orchestral music, especially piano music of Bach, Mozart, Beethoven, Schubert, Mendelssohn, Chopin, Schumann, Liszt, Brahms, Tchaikovsky, Scriabin, and Rachmaninoff. My greatest Chopin collections are the Rubinstein Chopin Collection 11CDs (released in 1991) by RCA and the Complete Chopin Edition 17CDs (released in 1999) by Deutsche Grammophon. Besides, I am interested in comparing different versions of a masterpiece played by various pianists. I also like searching and reading articles about classical music. My most favorite composer is none other than Frederic Chopin. No composers' music has ever enjoyed such lasting and continuous popularity with so wide a range of people as Chopin's. In Rubinstein's words: "Chopin was a genius of universal appeal. His music conquers the most diverse audiences. When the first notes of Chopin sound through the concert hall there is a happy sigh of recognition. All over the world men and women know his music. They love it. They are moved by it. Yet it is not "Romantic music" in the Byronic sense. It does not tell stories or paint pictures. It is expressive and personal, but still a pure art. Even in this abstract atomic age, where emotion is not fashionable, Chopin endures. His music is the universal language of human communication. When I play Chopin I know I speak directly to the hearts of people!" My first attempt to Chopin's world was the Nocturne Op.9 No.2 when I was 15 years old. Since then, his music plays an important part in my repertoire. My most favorite work of Chopin has been the Barcarolle Op.60 in F sharp major. Since 2008, I have been the editor for the Chopin category of the Open Directory Project, the largest and most comprehensive web directory acting as the basis for search engines. I launched this website on the 150th anniversary of Chopin's death (October 17, 1999) in memory of the great composer. At that time, the online resources about Chopin and his music were extremely limited. 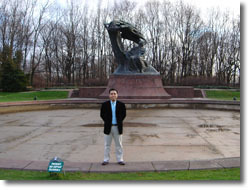 I tried to gather information from different sources, especially through the great contribution of visitors in the "Questions" section and the old discussion board to create a place where visitors can find information about Chopin for school projects, further reading, and enjoyment of Chopin's music. The website gained its popularity in a short time and has been a favorite place for Chopin's music lovers all over the world. I am grateful for continued contribution, support, and participation from visitors and friends. With this site, I hope that people having interest in Chopin's music can exchange their ideas, play the games and above all discover the world of Chopin. If you have any suggestion, please feel free to contact me at fredericchopin at yahoo dot com. Please also bring to my attention any error or controversial issue you found at this website. Thank you for visiting and please do not forget to sign my guestbook. Paying homage to Chopin, I have visited several historic sites related to the composer in Warsaw and Paris during my European conference travels. Chopin spent the first half of his life in Poland and the second half in Paris. It has been a worthwhile experience for me as I feel closer to Chopin and more appreciative of his creation. Also called the Royal Baths Park, Łazienki Park is the largest park in Warsaw and maybe one of the most beautiful in Europe. 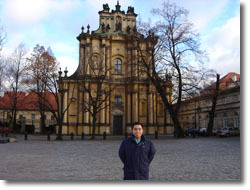 Built in the 17th century by Tylman van Gameren and later by Stanisław August, it is located south of downtown on Ujazdów Avenue, Agrykola Street, and the Royal Route. Although famous for its Palace on the water (Pałac na Wodzie) and the historical bathing pavilion, the Park nowadays attracts many visitors because of Chopin statue. 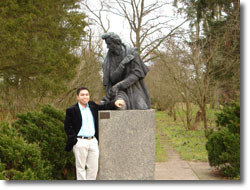 Many consider this statue the best of all Chopin monuments in the world. It was designed by sculptor Waclaw Szymanowski in 1926. 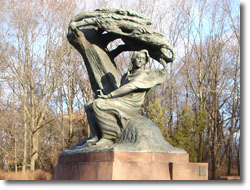 The monument shows Chopin sitting under a willow tree and listening to the sound of nature in the wind while composing his masterpieces. It is interesting to know that the willow tree represents five fingers of Chopin's hand. The wind blows from the west into his right ear and the music comes out to the east from his left ear. Standing near the statue, I felt like I could hear his music somewhere in the wind! Located on Krakowskie Przedmieście Street, this Roman Catholic church is one of the most notable baroque churches in Warsaw. Construction started in 1682 and completed in 1757. Originally designed by Józef Fontana, it was destroyed during World War II and rebuilt in a similar style by B. Zborowski. The Church has a statue of Christ bearing his Cross in the front designed by Pius Weloński. 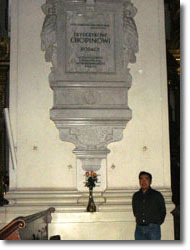 The Church has pillars containing urns of many famous Polish artists' hearts. 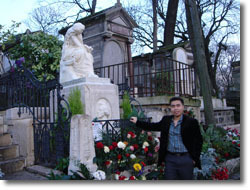 Chopin was buried in Paris in 1849. According to his wish, his sister Ludwika brought his heart to his homeland and placed in this church. The pillar dedicated to Chopin was located on the left of the main entrance. His heart has been kept in an urn above the bouquet near the pillar bottom. There have always been flowers in memory of the maestro. Located on the Krakowskie Przedmieście Street in Warsaw, this church is one of the oldest in town that was not destroyed during World War II. Construction started in 1664. 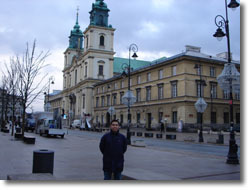 In front of this church stands the statue of cardinal Stefan Wyszyński. One of the most notable structure inside is the boat-shape pulpit above the ground on the left. 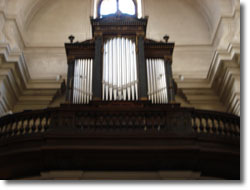 Chopin used to play this organ often during service for school pupils. It was said that only young Chopin was clever enough to play this organ. The Palace is also located on the Krakowskie Przedmieście Street in Warsaw. It was built starting 1643 and redesigned many times. During 1674-1818, the Palace belonged to the Radziwiłł family. Chopin gave his first concert in this Palace. Nowadays the Palace is the place for the president of Poland. 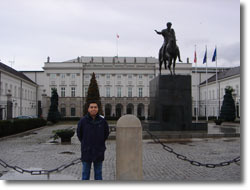 In front of the Palace stands the statue of prince Józef Poniatowski. 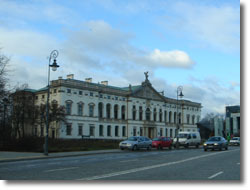 The Palace is located on Krasiński Square in Warsaw. 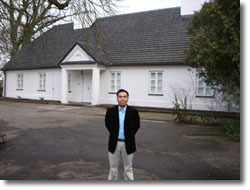 It was designed in baroque style by Tylman of Gameren and built starting 1677. Chopin moved to this place at 17 and lived there until the day he left for Paris. Nowadays the Palace holds old collections of prints and manuscripts for the National Library. 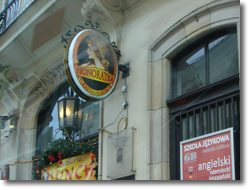 Honoratka is a historic restaurant located on Midowa Street in Warsaw. The interior design is very antique, giving visitors a cozy atmosphere. Chopin used to dine here. 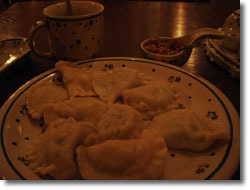 Pierogi is a traditional Polish food that visitors to Poland should not miss. It is similar to dumpling but the inside fillings are various such as potatoes, cheese, onions, mushroom, or meat, etc. It is often served with sugar, butter, or bacon bits, making the dish from sweet to salty. I really enjoyed the meal with a hot zurek soup. Żelazowa Wola is a village of Gmina Sochaczew district about 30 miles west of Warsaw. The village has a beautiful Masovian setting with willow trees along the roads. It is a very quiet and relaxing place and especially famous for the manor of Chopin's family. The Chopin's house was located in a park with four chestnut trees in the front, a spring on the side, and a garden on the back. It was in this house that Chopin was born and spent his childhood summers with friends. I could hardly believe that I myself finally stepped into this peaceful land of the maestro's birthplace. This is another famous Chopin monument not in Poland but in France. Parc Monceau is located in the 8th arrondissement of Paris with the main entrance on boulevard de Courcelles. The park was made possible by Phillippe d'Orléans in English style with curvy paths, shaded walks, Roman columns and archways, hence one of the most beautiful and charming in Paris. Scattered across the park are statues of prominent French artists. Sculpted by Jacques Froment Thomas in 1906, the Chopin monument is situated on the right side of the main entrance where Chopin was said to come to meditate. The statue shows Chopin playing the piano with an angel flying in the background and a woman seating with hands covering her eyes and deeply affected by the music. 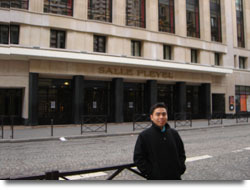 Salle Pleyel is also located in the 8th arrondissement of Paris with the main entrance on rue du faubourg Saint-Honoré. The original hall was open in 1830 on rue de Cadet. Chopin performed his first and also last concert in Paris at this concert hall. In 1927, the Pleyel manufacturer decided to construct a new concert hall at the current location and this concert hall has been attracting great names of classical music. 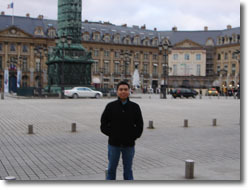 Place Vendôme is situated in the 1st arrondissement of Paris between l'Opéra Garnier and Le Jardin des Tuileries. It was established in memory of the grand monarch of Louis IV in 1699. Napoleon later ordered to build the column to celebrate the victory of Austerlitz in 1805. 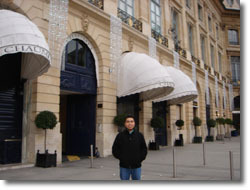 It has been famous for luxurious hotels and fashion shops. Chopin lived at number 12 of this square and spent the last moments of his life there. On the top left corner of the entrance reads "Frédéric Chopin [...] est mort dans cette maison le 17 octobre 1849. At his bedside, Countess Potocka sang to him at his request. "Play Mozart in memory of me" were his last words. Located in the 20th arrondissement of Paris, it is one of the most visited cemetery in the world due to its resting place of many of the world's celebrities. The main entrance is on boulevard de Ménilmontant. It first opened as a cemetery in 1804 in response to the Paris government's decision to relocate most cemeteries near city churches out of the city center. Being the largest cemetery in Paris, it has been the home of over 300,000 people and the ultimate symbol for the rich and eminent class in the society. Over 3000 mourners saw Chopin off to this cemetery in October 1849. During Chopin's burial at Père Lachaise Cemetery, the Funeral March from his Sonata No.2 in B flat minor Op.35 was played in memory of the great composer. 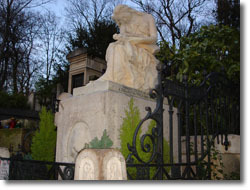 The monument on the top of the grave was designed by Auguste Clésinger. I visited the cemetery on a late Friday afternoon and as I expected there were many visitors paying tribute to the composer. 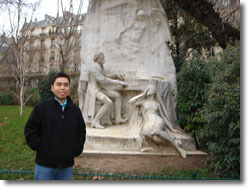 I felt that Chopin's marble grave provoked a sense of simplicity like the composer himself. I did not feel the usual cold cemetery atmosphere when standing at his grave surrounded by lots of fresh flowers and visitors. As I was leaving the cemetery, I rest assured that Chopin would forever live in the heart of music lovers from all over the world.